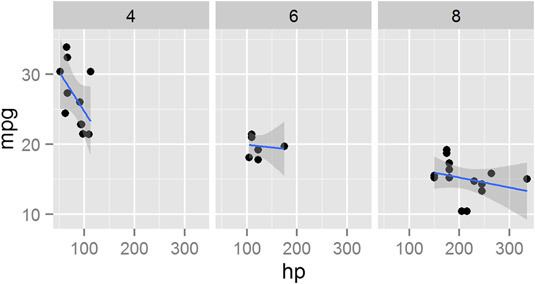 In addition to data, geoms, and stats, the full specification of a ggplot2 in R includes facets and scales. Facets allow you to visualize different subsets of your data in a single plot. Scales include not only the x-axis and y-axis, but also any additional keys that explain your data (for example, when different subgroups have different colors in your plot). Then, to add facets, use the function facet_grid(). This function allows you to create a two-dimensional grid that defines the facet variables. You write the argument to facet_grid() as a formula of the form rows ~ columns. In other words, a tilde (~) separates the row variable from the column variable. Similar to facet_grid(), you also can use the facet_wrap() function to wrap one dimension of facets to fill the plot grid. In ggplot2, scales control the way your data gets mapped to your geom. In this way, your data is mapped to something you can see (for example, lines, points, colors, position, or shapes). The ggplot2 package is extremely good at selecting sensible default values for your scales. In most cases, you don’t have to do much to customize your scales. 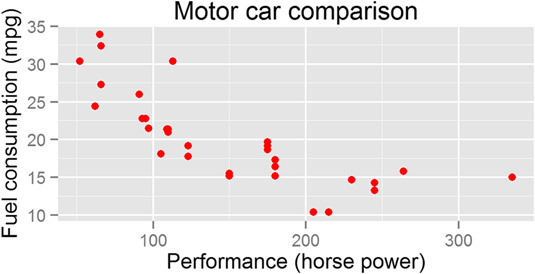 However, ggplot2 has a wide range of very sophisticated functions and settings to give you fine-grained control over your scale behavior and appearance. The name of a scale defaults to the name of the variable that gets mapped to it. In this case, you map factor(cyl) to the scale. To change the appearance of a scale, you need to add a scale function to your plot. The specific scale function you use is dependent on the type of scale, but in this case, you have a shape scale with discrete values, so you use the scale_shape_discrete() function. Similarly, to change the x-axis scale, you would use scale_x_continuous(). In ggplot2, you also can take full control of your titles, labels, and all other plot parameters. To add x-axis and y-axis labels, you use the functions xlab() and ylab(). Your graphic should look like the image below.